« Guest Post: Swimming Principles . . . They Work! 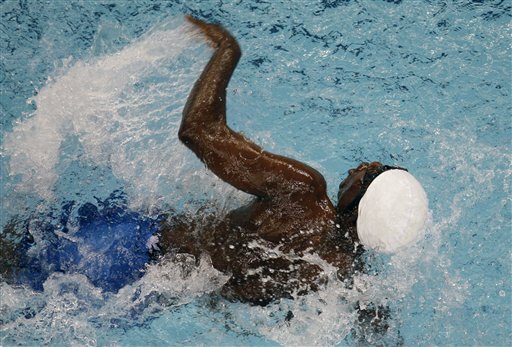 At the Beijing Olympics in 2008, Stany Kempompo Ngangola gained a measure of fame for swimming the 100-meter freestyle. Not for his speed, but simply for surviving. Stany was among a small group of athletes—mostly from small underdeveloped nations–who are invited to the Olympics in hopes that the exposure will encourage sports development in their homeland. These athletes are exempted from Olympic qualifying times. Stany was selected for this honor a year in advance and given assistance with preparation by coaches from advanced swimming nations. Unfortunately the training he was given focused mostly on conditioning with little attention to technique. Swimming in the first heat, Stany relied on youth and strength to get through his first 50-meter length, but hadn’t gone far on the second length before the commentators began to express concern—shared by everyone watching–about whether he could make it safely to the far wall. Here’s a picture of Stany—looking very athletic—in the air. And here is Stany in the water, struggling to complete 100 meters. What’s remarkable about Stany is how utterly unremarkable he is. I estimate that 95 percent of the millions who watched his struggles on TV would fare no better if put in that position themselves. You see, swimming, as an aquatic skill, is an ‘alien’ activity for land-adapted humans. Do you recognize the swimmer below? 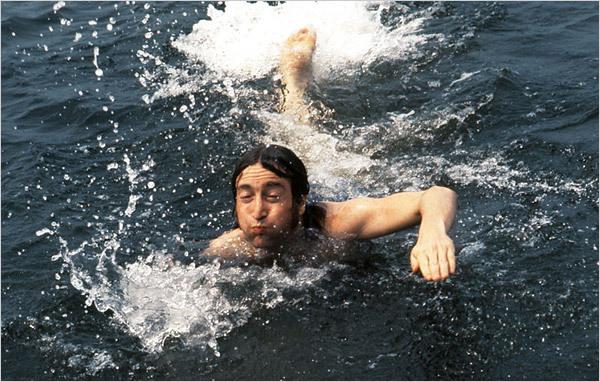 John Lennon — Human Swimmer! That’s why we say that it’s critical to recognize that—as inheritors of millions of years of adapting to life on terra firma—it is simply human nature to be an ‘energy-wasting machine’ in the water. This was confirmed by a study done by DARPA in 2005 while designing a swim foil for the Navy Seals. They found that dolphins convert 80 percent of energy into forward motion. The humans they studied (lap and fitness swimmers—people who thought they swam ‘okay’) were only 3 percent energy efficient. This bring us to Swimming Principle #1: Always focus on saving energy before increasing fitness. • When developing technique, master Vessel-Shaping skills (Balance, Core Stability, Alignment, and Streamlining, before propulsion skills (pulling and kicking.) Vessel-Shaping skills take little energy to perform and provide significant payback in energy savings. Propulsion skills require much more energy and power to perform. • Propulsion A: When you focus on your pull and kick, pay attention first to how you use the arms and legs to minimize drag, before focusing on how you apply pressure to the water. • Job One for your arms is to lengthen your bodyline, since that reduces wave drag. • Job One for your legs is to draft behind your upper body—not to churn the water into a froth. • Propulsion B: Strive to replace forces generated by your muscles with ‘available’ forces from nature—gravity and buoyancy. • Swim farther by learning to swim a shorter distance almost effortlessly—rather than pushing to add another length. 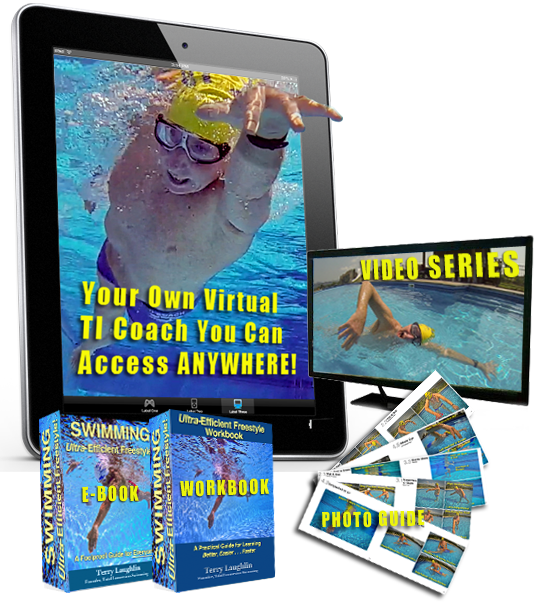 • Swim faster by learning to swim at your current speed as easily as possible. Faster times will then come as a matter of course. • Indeed, for any swimming set, task, or challenge, always start out with the intention to find the easiest possible way to complete it—rather than testing your ability to push through fatigue or discomfort. Learn energy-saving techniques with our downloadable Ultra-Efficient Freestyle Self-Coaching Toolkit. The drills and skills are illustrated in 15 short videos. Guidance on how to learn and practice each drill effectively is provided in the companion Workbook. very close to the surface . I have been anticipating a workshop coming to New Orleans. Only received the email on August 6th for this weekend’s workshop (8/8-8/9), too short a notice or else I would have been there. Notice the shadow on pool bottom of swimmer showing a streamlined vessel looks li a Swordfish! I learn, study and then attended a Total Immersion workshop in 2005. I am still learning, and swimming is now my favorite exercise. I am very grateful to your instructions and swimming principles. With my best regards and thank you Terry Laughlin. Good tips that make a lot of sense. Tips that make a lot of sense. Thank you. My 11 year old grandson is playing water polo. His swim technique needs attention. Any suggestions? Eric Moussambani, From Equatorial Guinea, achieved similar fame at the 2000 Sydney Olympics. His home country may have regarded him as a failure, but the British love a brave loser and “Eric the Eel” became the hero of the hour because of his determination to finish, despite the fact that it took him more than twice the time of the next slowest. I doubt that many can remember the names of any others who took part in the 100m freestyle fifteen years ago. Now I recall Eric the Eel. I would love to know what he’s doing now in swimming. But neither looked anything like Eagle or Eel. Show him some Total Immersion videos from our web site or youtube. See what he thinks. Find a TI Coach near him. Where does he live? Great advice as alwaysTerry. I started swimming in my late 50s 62 now . I know the shape I should be putting my body into and on one rail I think I get close to it but the other rail is really bad and effort is used in trying to get anywhere near a good shape. Even on land one side I can lie easily in a skate position the other is hard to maintain and I can feel the stretch using energy! Do you have any exercises to recommend to late to swimming people to improve flexibility to the poor side. Being new to the sport of triathlon, I struggled in the swim. This year I vowed to work on my form and found you! Absolutely love getting in the water now! I am so much more confident and relaxed. I exit the water, even after swimming a mile or more, revived and ready for more… Rather than exhausted. Terry, please find your way to one of our beautiful lakes here in North Idaho! Open water swimming is widely practiced! A workshop here may be well worth your time. You will never forget the beauty of our region! Coeur d’Alene, Hayden Lake, Priest Lake, lake Pend Oreille. Theresa I’ve heard great things about Lake Pend Oreille and it’s on my list. There’s an annual race there–Sandbridge?–I’d like to swim. I and other TI coaches have worked often with middle aged and older folks who feel they have lost a lot of range of motion. We’ve had great success in freeing up ample mobility through a combination of helping them discover needless internal tension and releasing it or sometimes helping them find a good accommodation. I gather from your email that you’re in the UK? Have you ever worked with one of our coaches over there? Also the 2nd set of skill and awareness exercises in our Self Coaching Toolkit are devoted to this. I’ve been wasting energy for over 40 years of swimming. Bought the easy freestyle video in early 2015 and focused just on balance and streamlining, went from 2:30 100m to 1:40 100m. No more sore shoulders or worn out rotator cuffs. I will continue with this technique for life and hope to build fitness in the coming years for open water swims! (2) That you did so by saving energy. Just an update Terry your reply plus some neck pain prompted me to take a good look at the perpetual motion DVD. I have found its not my flexibility its my rotation at fault.I am up to lesson five and have posted on the forum.I am so mad with myself for not using it properly before. Glad to hear you found your answer there.